The RESIDENCY PROGRAM offers self-directed creative time to mediamakers from throughout the country. Since 1971 we have assisted over 1100 artists in the creation of works using new electronic video, audio and computer technologies. Each year from among 80 applicants, about 45 artists are invited to work in the studio, in a retreat-like workshop environment, which offers access to an image processing system, intensive individualized instruction and time for exploration and personal creative growth. This year’s 50 artists represent 11 states, Canada and Switzerland. Over one-third are artists from outside New York State. Tapes produced at the Center were again included in EXHIBITIONS throughout the United States and Europe. Artists have been recently included in NY Expo of Short Films, Book/Ends, The Dumbo Short Film and Video Festival, the NY Video Festival and the Ohio Independent Film Festival. Tapes were shown at such venues Donnell Library, Millennium, Museum of Modern Art, the Whitney Museum, Anthology Film Archives, CEPA Gallery, The Kitchen, The Knitting Factory, and Art in General and at museums and galleries throughout Europe. Tapes are distributed by Electronic Arts Intermix, Filmmakers Coop, Drift Distribution, Facets, Women Make Movies and many others. Artists working at the Center this year have received awards and recognition from the Ohio Arts Council, the New York Foundation for the Arts, the New York State Council on the Arts, Canada Council and won numerous awards and citations in festivals around the world. For Black Box, a month-long exhibition at New Jersey College Art Gallery, the Center curated an installation of historical works created here over the last 30 years. Other organizations represented include MWF Video, Creative Television Association, Experiments in Art and Technology, Museum of Contemporary Art (Chicago) and The DeCordova Museum (Boston). The Center serves as a SPONSORING ORGANIZATION for artists’ projects in the electronic and film arts. We provide support services, assist with development and provide fiscal and administrative management services. We sponsor about 20 projects. Since 1996, total requests to foundations were over $800,000. We have administered awards to artists totaling almost $200,000. Completed projects have received worldwide exhibition and distribution. Irit Batsry received support from the New York State Council on the Arts in 1999-2000 for “These Are Not My Images (neither there nor here)”, a work which questions the way we see and show reality. It was premiered at the International Film Festival, Rotterdam in 2000, and has been widely screened in Europe. It received additional support from Academy of Media Arts, La Sept/ARTE, The Experimental TV Center, Central St. Martins College of Arts (London), Grand Canal (Paris), and The Lux Center (London). Slawomir Grunberg completed “School Prayer: A Community Divided”, an Emmy-award winning documentary illuminating the debate over prayer in the public schools. The project received past support from the New York State Council on the Arts, the Soros Documentary Fund and the Independent Television Service. Slawomir’s new documentary, “Through the Eyes of Albert Maysels”, received support this year from the New York State Council on the Arts. Alan Berliner received a major grant from the National Endowment for the Arts for work on “The Sweetest Sound”. This project has received support from the National Endowment for the Arts, ITVS, ARTE-TV, and Channel 4. It has been screened internationally by POV; Visions du Reel, Switzerland; Hirshhorn Museum, Washington; SXSW Film Festival; BBC2, London; Austin, Texas; Taos Talking Picture Festival; and the Berlin Film Festival. Alan’s new film, “Elegy”, received support this year from the New York State Council on the Arts. The Righteous Person’s Foundation awarded Alan major support for his film work in 2000. David Blair, a visual artist working in New York City whose feature-length film and Internet text project “Wax” has received world-wide exhibition and distribution, received support from the New York State Council on the Arts in 1999 for “The Telepathic Motion Picture of the Lost Tribe”, a feature-length project with Internet, installation and videotape versions. Amy Jenkins, a media installation artist, completed work on “Shelter for Daydreaming” which premiered at the John Michael Kohler Art Center, Wisconsin, with an event at Harvestworks in Manhattan. The project received support from the New York State Council on the Arts in 2000-2001, the Jerome Foundation, Finishing Funds of the Experimental Television Center, Harvestworks Digital Media Arts Center and the MacDowell Colony. Branda Miller, video artist, educator and media activist, teaches at Rensselaer Polytechnic Institute. Focusing on the relationships of art, technology and community, she experiments with media to support independent voices, explore new visions and stimulate critical perspectives. “Kids in Formation” is an investigation of how new information technologies are used to target young children and shape them as consumers, profoundly affecting the formation of their identities. 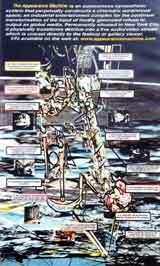 The project was supported by the New York State Council on the Arts in 2000-2001. 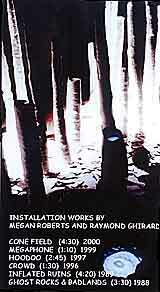 In 1999-2000, the New York State Council on the Arts supported “Time Shifts: A Visual Narrative”, a new work for computer graphics, text and video installation by collaborators Peer Bode, Joseph Scheer and Jessie Shefrin. Barbara Hammer was able to complete work on “The Female Closet”, with assistance in 1999 from the New York State Council on the Arts and the Wexner Center; she received support in 1998 for Culture Doctor. Since 1989 the Film and Electronic Arts GRANTS PROGRAM, has awarded over $650,000 to individual artists and arts organizations in the State. Now in its 12th year, Finishing Funds has provided over $150,000 in support of New York State artists, to assist with the completion of diverse and innovative work. The work supported represents the wide diversity of genres, techniques and styles, and includes film, video, websites and other works for new technologies. This year’s recipients were Robert Attanasio - belongings; Luca Buvoli - Trailer for Not-A-Superhero's Non-Adventures; Nancy Goldenberg - bedscape; Stephanie Gray - Is This City Disappearing; Thomas Allen Harris -That's My Face; Denise Iris -100 Mini Mentals; Jeffrey Lerer Manuscript Fragments Found at the Gilbert Hotel; Mary Magsamen - A Boy and His Dog; Darrin Martin - The Knocking; Jennifer and Kevin McCoy - 201: A Space Algorithm; Vince Mistretta - Medea; Ken Montgomery - Inner Eye; Yasuaki Nakajima - After the Apocalypse; Jenny Perlin - Perseverance and How to Develop It; Eric Rosenzveig - The Appearance Machine; Koji Tambata - Music Works Live. Panelists were Chris Borkowski ,Media Specialist for Hallwalls, and independent media artists and teacher Jeanne Liotta. The Media Arts Technical Assistance Fund is designed to help non-profit media arts programs in New York State stabilize, strengthen or restructure their media arts organizational capacity, services and activities. This year we are supporting projects by Third World Newsreel, NY Expo, Thundergulch, Film/Video Arts, Film Fleadh, Intelligent Agent, Children’s Media Project, the Media Archive of the Jewish Museum, Paper Tiger, Dumbo Art Center, Squeaky Wheel, and Filmmaker’s Coop. In addition we are able to assist organizations in attending such professional conferences as the NAMAC conference, Changing Media/Mediating Change, held October 11-14, 2000 in Minneapolis; the AMIA Annual Preservation conference, and the Alliance for Community Media - NE Regional Conference, held in March 2001. Over 20 organizations throughout the State participated in conferences with help from the Technical Assistance Fund. Presentation Funds provides support to New York State organizations for in-person appearances by film and media artists. The program brings innovative cinema programming, including independent film and media art created with new technologies, as well as audio installation works to new audiences and to underserved communities in all regions of the State. In addition, the program assists organizations which serve special constituencies and encourages the development of new presentation venues throughout the State. Presentation Funds supported in-person appearances before 18,000 people in 14 counties throughout the State. Sponsoring organizations contributed over $270,000 toward these media projects. In keeping with our EDUCATIONAL objectives, we hosted the 6th Annual International Student Residency, a 10 day intensive residency available for academic credit to graduate and undergraduate student. The workshop is co-taught by Pamela Susan Hawkins and Hank Rudolph. This year’s program featured a public appearance by media artists Kristin Lucas and Joe McKay at the Ti-Ahwaga Theater in Owego. We participated in “Revisioning Television” a three-week on-line salon organized by Eyebeam Atelier, incorporating three threads of conversation about the history of television. Representatives from over 30 institutions participated. We were invited to contribute a short article for “Snapshots from the Field”, organized for publication in Main and on-line at the NAMAC website. The Center is committed to the early history of media art and its PRESERVATION. Housed at the Center is a collection of over 1000 videotapes which chronicle work produced here over the last 27 years. We are a founding member of Independent Media Arts Preservation. As a past participant in the National Moving Image Database project of the American Film Institute, we have constructed computer-based catalog of videotapes, which will be integrated with institutional library holding around the world. 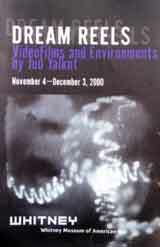 Launched in the Summer 2000, the Video History Web functions as a both a research collection and dissemination medium. The site is dynamic and interactive, encouraging contributions by visitors. Resources include critical essays, manuscripts, interviews, biographies, an extensive bibliography and information on collections, distribution, tools, preservation, organizations, and individuals. The site is fully searchable. We hear from individuals throughout the world who access and contribute to the site. We are now at work organizing Looking Back/Looking Forward, a two-day symposium to be held in Buffalo in the Fall of 2001, concerning moving image preservation inviting participation of 35 individuals from throughout the US and Canada.